Super storm Sandy certainly left it’s mark on Long Island. Perhaps one of the most significant changes was the re-opening of the “Old Inlet” area of Fire Island. The ocean now flows freely into and out of Bellport Bay with each tide cycle. Last fall, a short time after the storm, a couple of NACK kayakers visited the area to get a first hand look at the inlet. It’s just a short 2 mile paddle from the boat launch at Smith Point Park. The force of nature was clearly apparent where the ocean had reclaimed it’s access to Great South Bay. The inlet is located about a mile west of the Smith Point Bridge. Historically there have been many inlets on the south shore of the island. Some have opened and closed by natural processes while others have altered by outside elements. 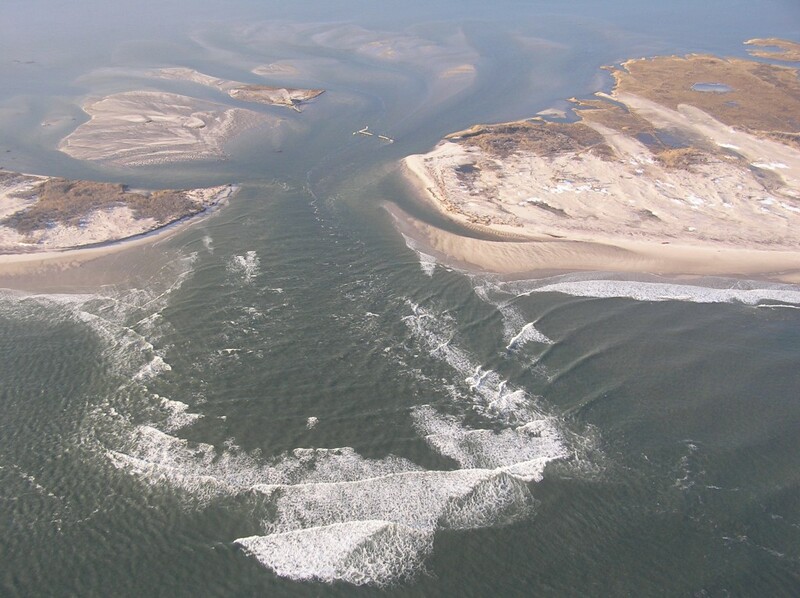 While two other breaches of Fire Island in built-up areas were quickly closed this inlet, in the wilderness area of Fire Island National Seashore, remains open. Controversy surrounds the inlet with many calling for it to be closed to protect South Shore Bay communities from rising tides. Scientists at the Stony Brook University’s “The Great South Bay Project”, who are closely monitoring the bay, have countered these arguments with scientific evidence that this is not the case. In fact they have observed significant water quality improvements in the bay. You can check out their report on the Impact on Great South Bay of the Breach at Old Inlet. Citizens for a Safe and Healthy Bay has started an online petition to stop the closing of the Fire Island breach at Old Inlet.